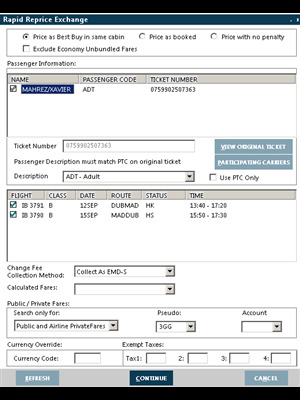 Rapid Reprice automatically calculates the new price for voluntary changes to an electronic ticket. Travelport Rapid Reprice benefits from more than 12 years design and development expertise. Travelport Rapid Reprice produces the required results for successful exchange, including any additional collection, refunds and/or change fee amounts. Though this installer is available for free download here, Travelport Rapid Reprice is a subscription product and requires a signed addendum to your contract. You will not be able to run Travelport Rapid Reprice transactions until you are an activated customer. New customers please contact your Travelport account manager for details. 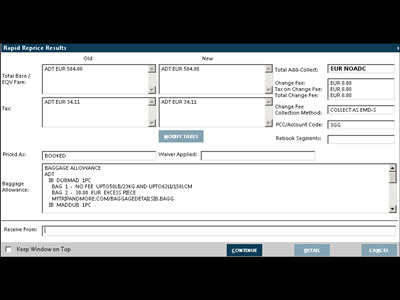 Automatically calculates the new price for the voluntary change of an Electronic Ticket on a participating carrier. 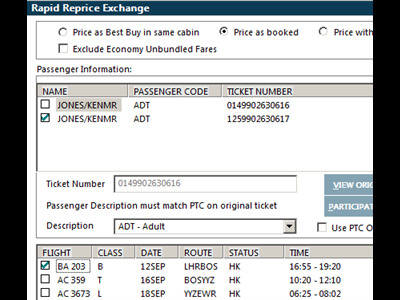 Uses historical data, current fares, and rules to re-price a revised itinerary. Displays results, including any additional collection, refunds and change or penalty fee amounts, to assist agents to complete the exchange.